There are varying opinions as to what constitutes innovation, but in our industry and in the engineering world as a whole, we typically think of innovation as being the use of technologies different from those we use at the moment to do things better, faster and cheaper. The complete industry news section from the May 2018 issue of Gear Technology. News on the latest products in the industry. Accurate prediction of gear dynamic factors (also known as Kv factors) is necessary to be able to predict the fatigue life of gears. Standards-based calculations of gear dynamic factors have some limitations. In this paper we use a multibody dynamic model, with all 6 degrees of freedom (DOF) of a high-speed gearbox to calculate gear dynamic factors. The findings from this paper will help engineers to understand numerous factors that influence the prediction of dynamic factors and will help them to design more reliable gears. Onshore and offshore wind turbines boast some of the most critical assets in order to run effectively. The complete Industry News section from the June/July 2013 issue of Gear Technology. News about the latest products in the industry. Special Advertising Section featuring Gear Expo exhibitors. News about all of the upcoming products int he industry. Gear Technology magazine begins the celebration of our 30-year anniversary. The complete Industry News section from the October 2013 issue of Gear Technology. Publisher Michael Goldstein explores Gear Technology's history and its future as he introduces the back issue archive online and our new features and columns for 2013. The gear industry is full of storytellers. It's a niche market that boasts a remarkable cast of characters that have been sharing their stories with us for 30 years. In that time, the editors and staff of Gear Technology magazine have had the privilege to report the ins and outs of this highly-specialized industry. From technical articles to case studies and features, the main focus of this magazine has been to "provide a forum of discovery and innovation for you, the gear manufacturing industry." Our Publisher, Michael Goldstein, said as much in our inaugural issue of May/June 1984. The complete product news section from the September / October 2014 Issue Gear Technology. Publisher Michael Goldstein describes what it means to him that Gear Technology is celebrating its 30th anniversary. The complete Industry News section from the January/February 2019 issue of Gear Technology. As most of you know by now, the trade show formerly known as Gear Expo is now the Motion + Power Technology Expo. If you're a gear-industry veteran, you might be confused by this change. If you've been coming to the show for years - or exhibiting at it - you might even feel a little betrayed. But I'm here to tell you it's going to be alright. The complete Product News section from the March/April 2019 issue of Gear Technology. Liebherr and Wenzel announce sales and service agreement; MPIF releases new powder metal standard; Gear Motions announces promotions; Profilator opens new factory and more gear industry news. See the latest gear industry products from Marposs, GWJ Technology, Norton|Saint Gobain, Mitutoyo, C&B Machinery, DMG Mori, Gear Motions and LK Metrology. Gear Technology's complete back issue archive is now available online. Read more about the archive in this issue's GT Extras. Also highlighted are a new video from Koepfer and the Gear Technology e-mail newsletter. The complete Product News section from the July 2018 issue of Gear Technology. You've been reading about it, talking about it, maybe even trying it. Gear Technology has jumped aboard it feet first and begun a voyage on the World Wide Web. Beginning with this issue, an electronic version of the magazine will be online. For those of us who still find the fax machine amazing technology, this is a great leap. This issue of Gear Technology, The Journal of Gear Manufacturing, marks the end of our second year of publication. As we approach our third year, it is time to review our statement of purpose. Gear Technology's primary goal was and is to be a reference source and a forum for the American Gear industry, and to advance gear technology throughout the world. As I travel around the country visiting with many of our customers, I am finding that not only are we, as an advertiser in the journal, meeting our advertising needs, but you are also meeting those very high ideals that you put before us during that meeting. The last two months have been both a time of difficulty and of growth for Gear Technology. Unexpectedly, I found myself in the hospital having surgery, and consequently out of commission for several weeks. At the same time, two individuals on our staff lost family members, and most of this period saw us getting ready for this preshow IMTS issue while being seriously short-staffed. Positive feedback regarding Gear Technology, the Journal of Gear Manufacturing, from some of its new readers. As the time came to write this editorial, the replies to our survey from the last issue were just starting to pour in. We were gratified by the number of responses we received and by the amount of time many of you spent answering in great detail the text questions on the survey. Because of this unusually large response, it will take us some months to log, digest and respond to all the data. Thank you for this nice "problem." As Gear Technology moves toward its third anniversary, we feel that we have reached a point in our development where it is time to pause, reflect on our accomplishments and plan for the future. Have you ever been to Malaysia? How about Indonesia, Brazil, Slovakia or Russia? Well, we have. We go there every issue. Michael Goldstein talks about 25 years of Gear Technology, looking behind as well as ahead. 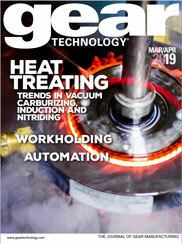 Publisher Michael Goldstein describes the success of Gear Technology's new e-mail newsletter programs. Publisher Michael Goldstein describes his experiences at the IPTEX 2012 show and the unveiling of Gear Technology India. In India, “namaste” is used as a common greeting. Although it translates literally to “I bow to you,” it’s often used the same way we use “hello” or “good-bye.” It’s a phrase commonly exchanged between individuals when they meet, and it’s also used as a salutation when they part. I’m using the phrase here because I’d like to introduce you to an exciting new project and venture for Randall Publications LLC. Expertise is a resource that's hard to sustain. We're doing our part via our "Ask the Expert" feature. How about you? Six years ago this month, the very first issue of Gear Technology, the Journal of Gear Manufacturing, went to press. The reason for starting the publication was a straightforward one: to provide a forum for the presentation of the best technical articles on gear-related subjects from around the world. We wanted to give our readers the information they need to solve specific problems, understanding new technologies, and to be informed about the latest applications in gear design and manufacturing. The premise behind Gear Technology was also a straightforward one: the better informed our readers were about the technology, the more competitive they and their companies would be int he world gear market. Every now and then a magazine has to take its own pulse or lose sight of its key mission - providing its readers with information they want. We did it this last year through surveys, interviews with subscribers and focus groups. Our basic question was, how are we doing? Sometimes in the pressure to meet deadlines and handle the Crisis of the Day, we lose sight of the forest for the trees. As a partial cure for this syndrome, I recently reviewed the six interviews with gear industry leaders that have appeared in our pages during the last year, trying to get a grasp of a larger picture. It struck me with renewed force how six men, each with a lifetime of experience in this business, see the gear industry forest the same way. Just back from IMTS and once again, I'm struck by the enormous vitality and strength of the manufacturing sector of the U.S. economy. It has made a phoenix-like rise from the grave dug for it by pundits in the '80s and has come back more robust and competitive than ever. Every once in a while something happens to fundamentally change the nature of your business. Despite the best of intentions and the most careful planning, there's no way we can anticipate every event. What do you do, for example, when your two biggest competitors merge, when the economy collapses in the region that imports your products or when key employees leave your company? Your reactions may make the difference between success and struggling to survive. Until recently, there was a void in the quality control of gear manufacturing in this country (Ref. 1). Gear measurements were not traceable to the international standard of length through the National Institute of Standards and Technology (NIST). The U.S. military requirement for traceability was clearly specified in the military standard MIL-STD-45662A (Ref. 2). This standard has now been replaced by commercial sector standards including ISO 9001:1994 (Ref. 3), ISO/IEC Guide 25 (Ref, 4), and the U.S. equivalent of ISO/IEC Guide 25 - ANSI/NCSL Z540-2-1997 (Ref. 5). The draft replacement to ISO/IEC Guide 25 - ISO 17025 states that measurements must either be traceable to SI units or reference to a natural constant. The implications of traceability to the U.S. gear industry are significant. In order to meet the standards, gear manufacturers must either have calibrated artifacts or establish their own traceability to SI units. Let's face it. The Internet is still, to many of us, exciting, confusing, terrifying and frustrating by turns. The buzzwords change so fast that even the most high tech companies have a hard time keeping up. Cyberspace. Firewall, Java. E-commerce. The list goes on. Welcome to the new Gear Technology. With this issue we begin bringing you a new look - a new cover, new graphics, a new, broader and more inclusive editorial focus. Our goal is to be an even better resource for the entire gear industry. It always strikes me as something of an irony that the brightest holidays of the year fall in the deepest part of the darkest season. They come when the days are the shortest, the clouds the thickest, the weather (at least in Chicago), the worst. And yet it is at precisely this time when we celebrate the happier human emotions of family, love, and charity and somewhat arbitrarily declare a "new" year. Beginning with our next issue, some of the promised changes in format for Gear Technology will begin showing up in these pages. As part of our commitment to provide you with important information about the gear and gear products industry, we are expanding our coverage. In addition to continuing to publish some of the best results of gear research and development throughout the world, we will be adding special columns covering vital aspects of the gearing business. Investigation of Gear Rattle Phenomena The article by Messrs. Rust, Brandl and Thien was very interesting in its description of the problem and of some of the interactions which occur. This issue of Gear Technology marks another milestone in the life of our magazine. After publishing 51 issues - nearly 200 articles containing close to 2,500 pages - we're ready to try something new.